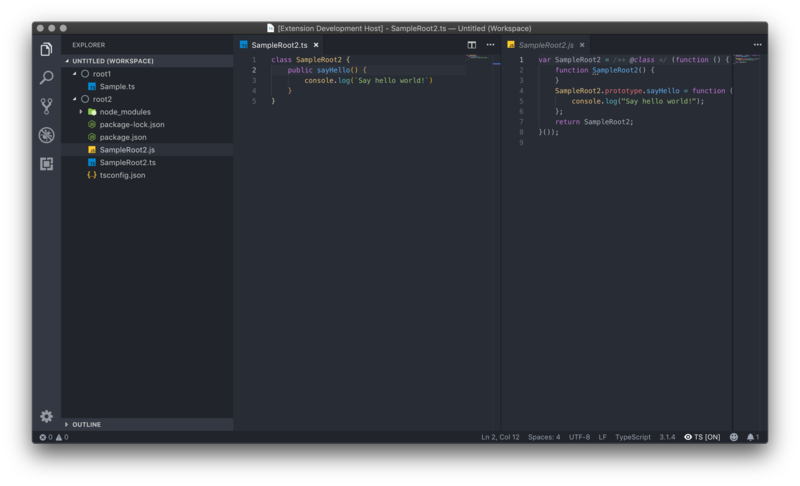 Visual Studio Code>Other>TypeScript Auto CompilerNew to Visual Studio Code? Get it now. 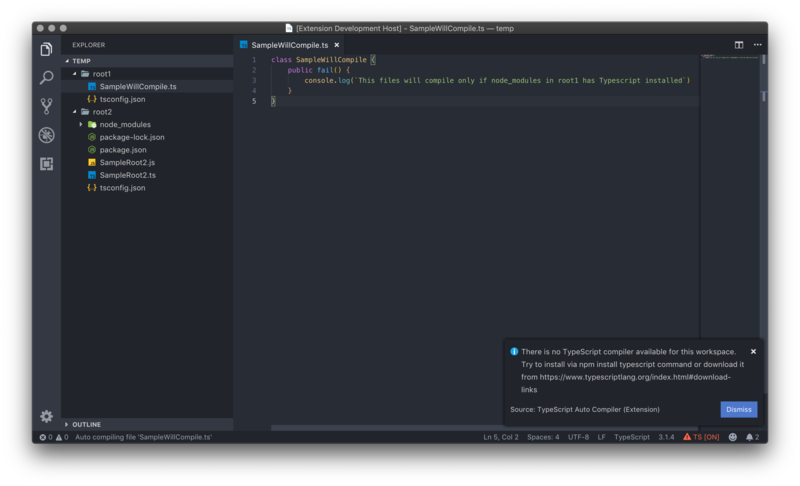 TypeScript auto compiler plugin. Watch for changes in .ts and tsconfig.json files and run tsc command to build them. Can use tsconfig.json files for batch build or build single .ts archives. This is a TypeScript extension designed to build automatically any opened .ts on file changes. Important Note: this extension still is in BETA build and may not work properly in specific scenarios Fill free to report any bugs and features in GitHub Extension Repository. Due to restrictions realted to the implementation for multi-root workspaces and cross-platform compilation, the extension now needs a proper tsconfig.json file to work. External TypeScript compiler (aka tsc) must be installed to work properly. Note: No longer needed a TypeScript bootstrap installation in Windows. You can use you workspace node_modules or global node_modules instead. Two brand new settings are available. These setting are automactlly changed to never when you hit the Never show again button from alerts. Support for multi root workspace has arrived. No other issues has been found. Fell free to report any issue in our GitHub page. Extenions uses tsc compiler in following order: from your node_modules dependencies (no need for a full Windows installation); from global node_modules path; then from Environment Path (Windows .exe installation). More plataform agnostic with .exe (Windows Executable) dependency remotion ~ Thanks to @daslicht!